New Yorkers Urged to Drink Tap Water City officials say that in an era of bottled water, a lot of New Yorkers don't appreciate how good their municipal water is. So they've recently launched a campaign to get people to rediscover the benefits of tap water. 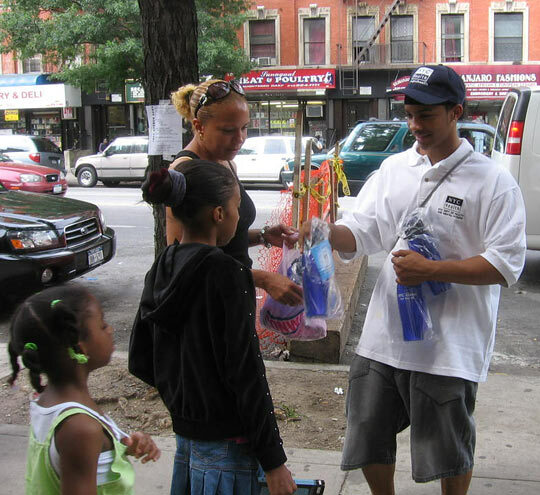 David Vasquez (right) hands out empty city water bottles in Harlem. The campaign is intended to encourage people to fill them with tap water. City officials say that in an era of bottled water, a lot of New Yorkers don't appreciate how good their municipal water is. So they've recently launched a campaign to get people to rediscover the benefits of tap water. City Health Commissioner Thomas Frieden acknowledges that tap water may be a tough sell because many New Yorkers come from places where it's unsafe to drink. Or they're simply getting out of the tap water habit. So the city recently kicked off a campaign called Get Your Fill, with ads extolling the virtues of tap water. The city recently dispatched a team of young men to Harlem to hand out empty blue plastic bottles. The idea was that instead of buying spring water, people could fill the bottles with tap water and carry them around all day. But once people learned what the bottles were for, many were skeptical. Vida Asiamih says she lives in an apartment building where the pipes are said to be bad and she's about as likely to drink tap water as she is gasoline. The campaign has ruffled some feathers in the beverage industry. Joe Doss, who heads the International Bottled Water Association, doesn't dispute the idea that New York has good water. Doss says bottled water has exploded in popularity not because it's better than tap water, but because it's healthier than other beverages like soda. The city has also taken shots from some of the local media, who fault it for spending money on an ad campaign right after raising water rates. But city officials are standing firm. Frieden notes that if people drink tap water, they're less likely to consume sugary beverages. "New Yorkers will be better off it they drink more water," he says. "And if promoting water consumption results in a reduction in obesity and diabetes, it's actually going to save the city a lot of money." The city says that buying less bottled water means fewer plastic bottles getting tossed out, which benefits the environment. Frieden also says New Yorkers have paid for a great water system. It only makes sense that they use it.